There's a free carbon-questionable forum, at Council's Civic Reception room in Spence Street tonight. 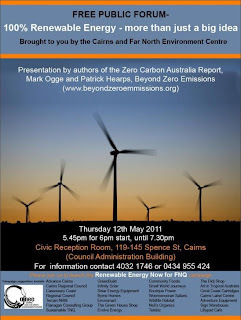 The meeting will be presented by Mark Ogge and Patrick Hearps of Beyond Zero Emissions, authors of the Zero Carbon Australia Report. 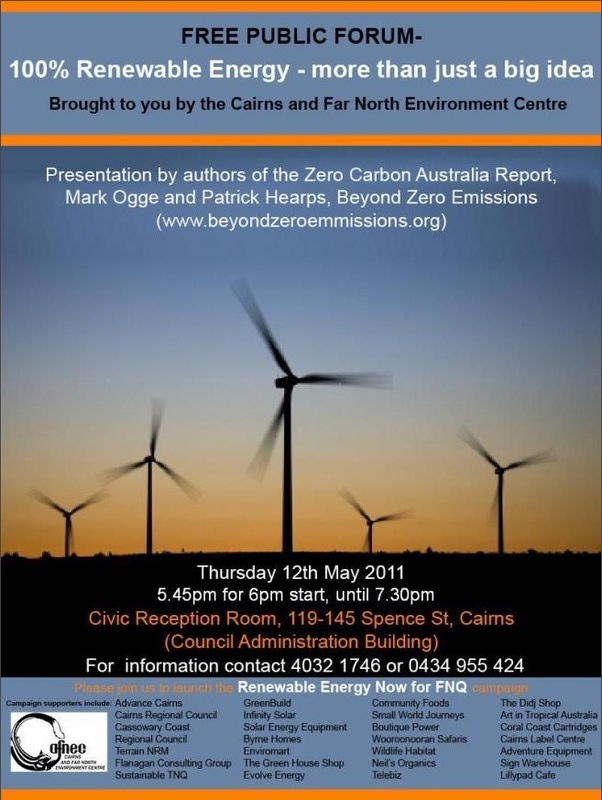 The event has been organised by Cairns and Far North Environment Centre. Unfortunately, most “flat earthers” seem so entrenched in their position of denial of the overwhelming scientific evidence for climate change (and the contribution of carbon dioxide emissions to this phenomenon) that nothing would convince them to change it, so I doubt this forum will do the trick! “Flat earthers” are like smokers, just a few decades ago, who would not accept the scientific evidence for the serious health risks associated with tobacco smoking, but clung on to the cigarette companies’ propaganda and the rubbish that a few sceptical scientists (usually paid by the tobacco companies) put their names to.